Fitbit Versa tracks all-day activity like steps, distance, active minutes and calories burned to show how every part of your day gets you closer to your goals. Water resistant up to 50 metres, meaning you're free to wear it in the pool, shower, and at the beach! Use pure Pulse 24/7 heart rate to better track calorie burn, optimize effort during workouts, see your resting heart rate trends and cardio fitness level in the Fitbit app. Get notifications for calls, texts, calendar events and apps like Gmail and Facebook, plus send quick replies right from your wrist. Works when your phone is nearby; quick replies on Android only. With a super-light anodized aluminium case and hi-res colour touchscreen, Fitbit Versa is sleek and comfortable at once. With a vibrant aluminium case and bright band colours, Fitbit Versa Lite Edition lets you express yourself in a big, bold way. 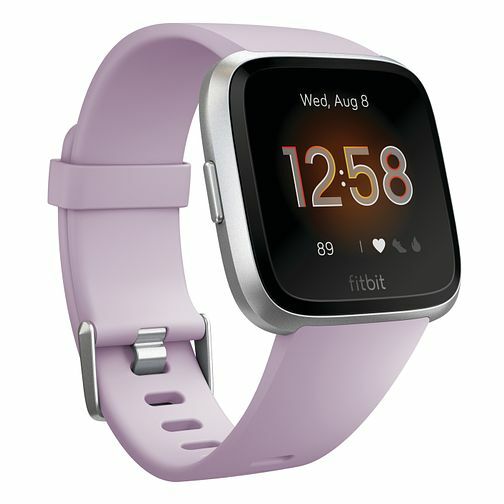 With a simple one-button design, Fitbit Versa Lite Edition is easy for anyone to use!